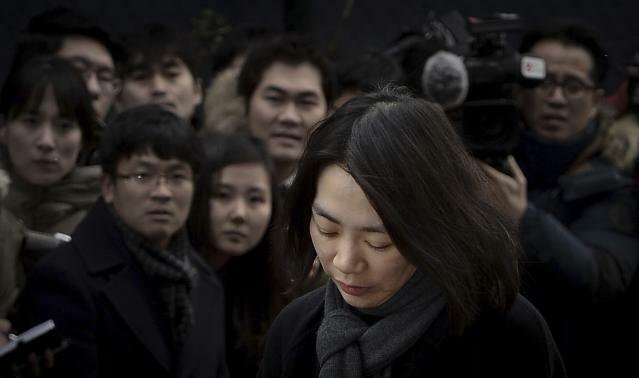 Former Korean Air Vice President Heather Cho has apologized for delaying a company’s aircraft over a serving of nuts, in her first public appearance since the incident. Heather Cho’s father, Korean Air chairman Cho Yang-ho, also apologized at a news conference, amid a simmering backlash in South Korea. Cho Yang-ho said his daughter, who has resigned from the airline, would be stripped of roles in affiliated companies. The South Korean government is probing the incident, which has dominated headlines. Heather Cho, also known as Cho Hyun-ah was onboard a Korean Airlines plane departing from New York for Incheon last week when she demanded a crew member to be removed, after she was served nuts in a bag, instead of on a plate. Korean Air initially defended Heather Cho’s behavior, noting that as vice-president overseeing flight service, she was responsible for making sure service standards were upheld. The airliner later apologized. On December 12, Heather Cho bowed in apology when she spoke to reporters outside a government building, where she was due to meet transport officials. “I sincerely apologize,” she said, adding that she planned to say sorry personally to affected crew members. Hours earlier Cho Yang-ho called a press conference and said he was apologizing “as a father and head of Korean Air”. He also announced that his daughter would step down from all her posts in companies under the Cho family-owned Hanjin Group, which also owns Korean Air. Heather Cho was the chief executive of KAL Hotel Network, Wangsan Leisure Development, and Hanjin Travel Service, and also a board director of Korean Air, according to Yonhap news agency. The Hanjin Group is one of South Korea’s top family conglomerates, called chaebol. Some South Koreans resent the chaebols for dominating the economy. Some of the families running these businesses have been accused of acting with impunity, and running companies with a lack of transparency or poor corporate governance.